The banner was displayed for about five minutes over the railing on the top tier near the Justin Langer Stand during Perth Scorchers' innings against Sydney Thunder on January 24. 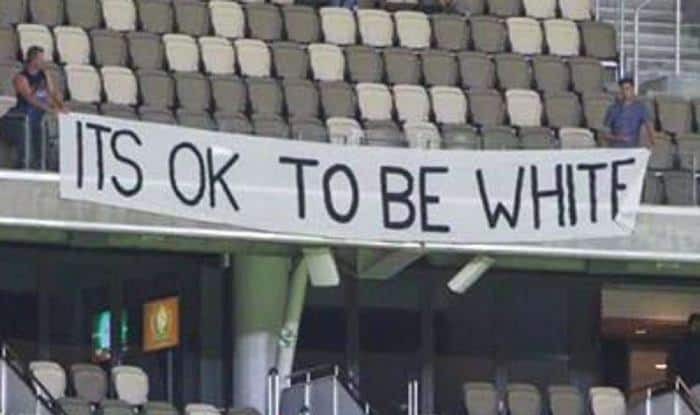 Three men who unfurled an ‘It’s ok to be white’ banner during a Big Bash League (BBL) match at the Optus Stadium in Perth will receive a first and final warning from Cricket Australia. The banner was displayed for about five minutes over the railing on the top tier near the Justin Langer Stand during Perth Scorchers’ innings against Sydney Thunder on January 24. The men took down the banner shortly after reportedly being spotted by security and were issued move-on notices by police, reported ESPNcricinfo on Thursday. “Three people in question were immediately removed from the venue and they will be issued a first and final warning from Cricket Australia,” a CA spokesperson said. “Cricket Australia takes a zero-tolerance approach to anti-social behaviour at any of our matches, which includes racial vilification. We encourage anybody who may witness this at one of our matches to report the matter to security or a member of staff immediately,” the spokesperson added. The slogan, which is associated with white supremacist groups, gained visibility in October last year when senator Pauline Hanson had put forward a motion declaring ‘it’s OK to be white’. Subsequently, Australian government senators supported the motion before voting against it the second time around. “Our message to any fan attending a match is that if you display anti-social behaviour you will be removed and risk being banned from any cricket match across Australia, along with police action,” the spokesperson said. Meanwhile, Sydney Thunder defeated Perth Scorchers by six-wickets and four balls to spare.